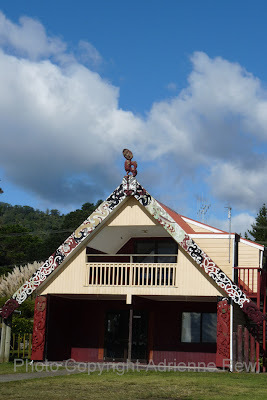 This blog provides a visual-verbal snapshot of Maori culture and contemporary Maori lifestyles in modern New Zealand. 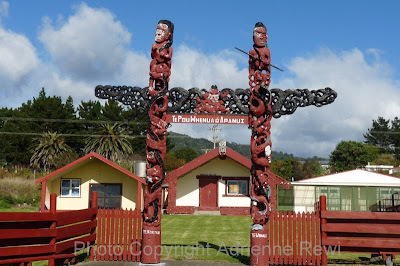 It presents my own experiences and observations of Maori culture and is not intended in anyway to be the definitive view on all things Maori, but rather an introduction for those who want to know more about Maori culture and its place in everyday bicultural New Zealand. 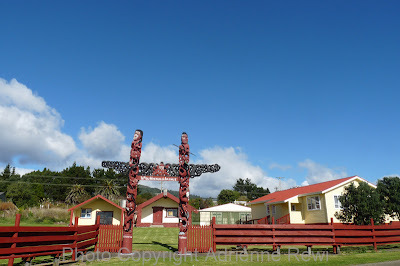 It was a sunny, early afternoon in May when I swung sharply off State Highway 35 near the Omaio Store on East Cape. I’d spied a big group of waka pulled up onto the grassy hillocks just above the sand and I needed to investigate. (I wrote a blog about those waka back in May and you can read it if you enter Omaio into the blog search box above left). 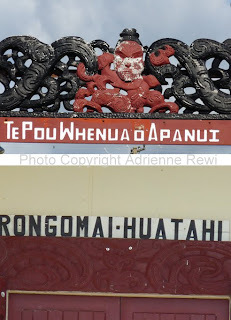 This narrow road – the Old Coast Road – continues on to the Hoani Waititi Reserve but I never got that far because in addition to the waka, there were the wonderful carvings on the marae directly across the road from the beach. 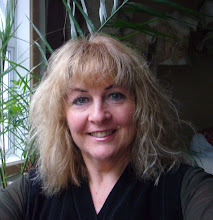 NZ-born freelance Journalist, Photographer, Travel Guide Writer, Fiction Writer,Traveller, Observer. Journalist. Author of 7 editions of Frommer's New Zealand & 1st Ed of Frommer's NZ Day by Day, J.Wiley & Sons, New York 1999-2012).Author of Architects at Home, (1995);Private Views,(1996);Fine Cheese,(1996). Short stories published in Another 100 NZ Short Short Stories(1998);The Third Century(1999);One Hundred New Zealand Short Short Stories 4(2000) Tandem Press, NZ. Included in Dream Vacations -Frommers Travel Experts Choose Their Favourite Places on Earth(2007,Wiley, NYC). Prior to returning to fulltime journalism in 1988, I worked as a fulltime exhibiting artist. PLEASE NOTE: ANY PHOTOGRAPHS, WORDS OR IMAGES ON THIS BLOG ARE PROTECTED BY INTERNATIONAL COPYRIGHT LAW. You do not have permission to reproduce, transmit, publish, copy or sell these works in any form, including personal use, without the permission of Adrienne J Rewi.